Motion sickness is something that many people suffer from while traveling, thought to be caused by conflicting signals in the inner ear, eyes, and sensory receptors. These glasses are supposed to prevent motion sickness. 126 Comments on "Motion Sickness Glasses"
that is awesome. I have a friend whose whole family gets motion sick, that would really help. THIS IS AWESOME WHO HERE AGREES!? 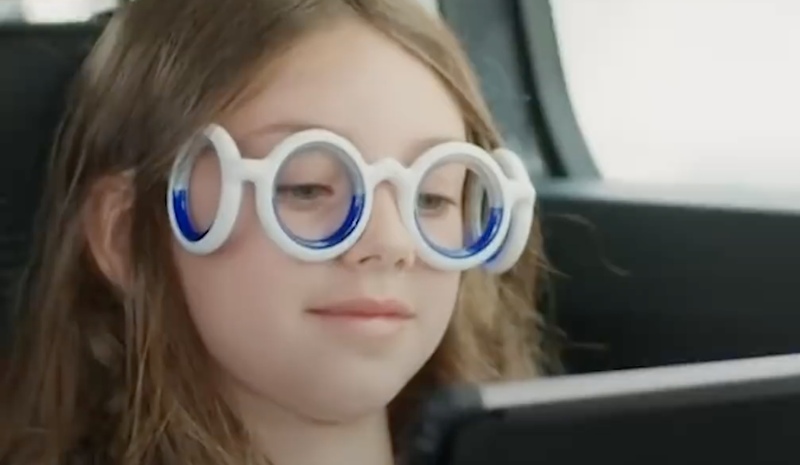 Oh my gosh I need those because I have bad motion sickness. this is really cool. I think its a very nice idea and I’m glad it helps people who struggle with motion sickness. That is cool my brother gets sick on any type of vehicle ride this would help. this is a product that can help so many people! i thought the video was really cool like how it tells what the product does and how it hepls people. That’s pretty genius. The kinds of things people can come up with to alleviate problems is awesome. Very cool. I know a lot of people that would love to use those. I get motion sickness all the time, this is super useful. This is great so many people suffer from motion sickness and this is a good alternative to taking medicine for it. Wow, I really need those. I get really sick in cars, plane, bus… anything. that is really great and would be great for some of my friends that get motion sick. I know some one who gets really bad motion sickness, she would love to have this. This is awesome! I need a pair of those! wow this is sooooooooooooooooooooooooooooooooooo cool i have motion sickness and its horible.